What are the most popular online bachelor's degrees offered in Hawaii? Hawaii is a member of the Western Interstate Commission for Higher Education. The institution provides students from 16 participating states with tuition reduction opportunities. Most notably, that includes a professional student exchange program, which allows students from Hawaii to enroll in select out-of-state programs without paying exorbitant tuition fees. Additionally, the Hawaii Department of Education provides adult learners and college-bound high school students with online college prep and distance learning options, and the Hawaii Virtual Learning Network (HVLN) consortium provides online instruction for residential K-12 students and teachers in continuing education programs. Of the relatively few online colleges in Hawaii, the largest online education provider is the University of Hawaii. The school currently offers two fully online undergraduate programs. Though it has struggled to expand its online course offerings in recent years, UH has a long history of television-based distance learning programs. UH also unveiled a new hybrid psychology degree recently, though it is not yet offered entirely online. Responding to lagging graduation rates and budgetary challenges, the university is working to expand online degree completion programs to help community college students from neighbor islands finish their four-year degrees. Tuition at four-year public universities in Hawaii increased by 97.6% from 2007 to 2012. Additionally, Hawaii is one of the most expensive states to live in, and those two factors make online education attractive to students both in and outside of the state. Increasingly, students are turning towards distance education programs in Hawaii, a trend that should only grow in the coming years. The only Catholic University in Hawaii, Honolulu-based Chaminade University is a small, private institution where about 2,500 students engage in a collaborative learning environment dedicated to life preparation, service, and successful careers. Chaminade offers 25 undergraduate and graduate programs in a number of disciplines, including the fine arts and humanities, sciences and mathematics, education, and behavioral sciences. One of the best online colleges in Hawaii, Chaminade offers several 100% online bachelor's degree programs in fields ranging from business and English to criminal justice and religious studies. Programs of note include the BA in historical and political studies, in which students study societies, governments, and institutions in a curriculum that incorporates the perspectives of Asian and Pacific communities. The school offers four bachelor's degrees in education alone: BS in early childhood education; BS in early childhood education--Montessori credential; BS in elementary education; and BS in secondary education. UH West Oahu allows students to take upper division classes in an online format. UHWO’s online platform features courses in business administration, public administration, early childhood education, political science, and several other subjects. While most upper division courses are available online, prospective distance learners must complete all introductory material on campus. Students may take their lower division courses at either UHWO or at partnering online colleges in Hawaii. Distance learners can take online classes in one of two formats. Some courses are offered entirely online through the school’s Laulima platform, which is the course management tool used by all UH schools. Other classes are taught through interactive television. These courses are run through UHWO, and students are required to assemble at participating classroom facilities sprinkled throughout the Hawai’an islands. In addition to the online degrees available, distance students may also pursue several certificates, including offerings in substance abuse and addiction studies, healthcare administration, and disaster preparedness and emergency management. The University of Hawaiʻi at Mānoa (UH Manoa) is the flagship campus of the University of Hawaiʻi system with approximately 19,000 students, a diverse community of learners, and unique research opportunities. UH Mānoa's students receive a high-quality education via 18 colleges and schools offering 100 bachelor's degrees, 85 master's, and five professional and doctoral programs. UH Mānoa is nationally ranked in numerous program areas such as agriculture & forestry, biological Sciences, law, and physics. UH Mānoa is one of the online colleges in Hawaii offering online bachelor's degrees in numerous fields, such as business administration, education, nursing, and public administration. The school's BA in social sciences is notable for its four tracks: applied, early childhood education, political science, and psychology. The BA in public administration has four tracks: disaster preparedness and emergency management, general public administration, healthcare administration, and justice administration. Founded in 1965, Hawaii Pacific University (HPU) serves more than 5,000 students, making it one of the largest private universities in the state. In addition to campuses in Honolulu, Kaneohe, and O‘ahu, HPU offers several online programs and courses at the undergraduate level, as well as two degrees at the graduate level -- including an online MBA and a master's degree in organizational change. These offerings make HPU one of the best online colleges in Hawaii. Online courses feature a mixture of asynchronous and synchronous delivery. This blend allows students to benefit from both flexible study times and the real-time collaboration and interaction with instructors and peers. While the school makes most online courses at HPU accessible entirely online, some classwork may require students to take tests in person at an approved testing site. For admission, freshmen applicants need a strong academic record. Transfer students need a 2.75 GPA; admissions assesses transfer credits on an individual basis. The University of Hawaiʻi at Hilo (UH Hilo) is a state university with a private college learning environment. The school offers 37 undergraduate, eight graduate, and four doctoral programs -- some of which can be taken via e-learning options. The liberal arts and science institution's approximately 4,000 students have opportunities to immerse in a rigorous education featuring low faculty-to-student ratio, many research opportunities, and hands-on learning -- all at an affordable tuition rate. One of the best Hawaii online colleges, Uh Hilo offers two bachelor's degrees completely online: BA in psychology, with a requirement that students complete the school's general education and other course requirements prior to program entry; and an RN-to-BSN. Uh Hilo's distance learning is delivered via video-conferencing. The school also offers an extensive list of individual courses that can be taken online toward many bachelor's programs. If you want to qualify for a range of high-paying job opportunities, earning a college degree is key. When deciding where and what you want to study, you may end up weighing both in-state and out-of-state schools. If you are from Hawaii, there are many advantages to attending college in your home state. Sticking close to home can qualify you for in-state tuition and help you build a network of regional professional contacts. You may also benefit from your school's name recognition on the local job market, and you'll be relatively close by if you need to occasionally visit campus. When researching programs, be sure to consider our list of the most affordable online colleges in Hawaii. All of the schools in this list are accredited, and our rankings highlight the colleges that offer the best blend of affordable tuition and return on investment. The University of Hawaii - West Oahu designed its distance learning programs primarily with students living on remote, neighboring islands in mind. Students need to complete general education and lower division coursework either on campus at West Oahu or through online courses at other UH campuses. Consequently, most students in UH West Oahu’s online programs are transfer students. UH West Oahu offers a total of nine online bachelor’s degrees and certificates, including undergraduate programs in business administration, public administration, early childhood education, political science, and psychology. The school offers both synchronous and asynchronous learning, with synchronous class meetings made possible by Interactive Television. Since the school waives several fees for online students, UH West Oahu is one of the most affordable online colleges in Hawaii. The University of Hawaii at Mānoa offers 24 bachelor’s and master’s distance education programs, primarily in the fields of education and nursing. The school’s nursing programs are the best in Hawaii. All freshman applicants to UH Mānoa should have a minimum high school GPA of 2.8, a 510 on the SAT or 22 on the ACT, and top 40% placement in their high school class. Transfer applicants must have completed 24 credits at their previous institution and have a minimum GPA of 2.5 (2.0 for Hawaii residents). An extensive list of scholarships, grants, work-study options, and flexible payment plans makes UH Mānoa one of the most affordable online colleges in Hawaii. Remington College is one of the few colleges in Hawaii that is not a part of the University of Hawaii system. Nevertheless, Remington maintains a strong distance education department, offering 10 online associate and bachelor’s programs and more than 100 continuing education courses. Remington is also one of the most affordable online colleges in Hawaii, thanks to its scholarship offerings and guaranteed fixed tuition rates. All freshman applicants must submit proof of a high school diploma or GED. Applicants must also pass a standardized entrance exam. The school accepts transfer credits on a case-by-case basis. All new online students who enroll at Remington receive a Kindle Fire. Chaminade University of Honolulu operates its Office of Professional and Continuing Education (PACE) with the goal of providing accessible education to busy, working professionals. The school offers 15 online associate and bachelor’s degrees. Programs utilize asynchronous learning for maximum flexibility. Chaminade’s PACE programs have looser entrance requirements than other colleges in Hawaii; freshmen need only submit a high school transcript to be considered for admission. The school has a number of financial aid and scholarship options available, including federal pell grants, FAFSA, and endowed Chaminade-specific scholarships. The Roman Catholic-affiliated university is one of the only affordable online colleges in Hawaii that is Christian-based. The University of Hawaii at Hilo offers six undergraduate and graduate online programs. Coursework in all programs combines asynchronous and synchronous learning. The most unique option is the Kahuawaiola indigenous teacher education program, which prepares teachers of Hawaiian origin to teach in schools with a strong Hawaiian cultural background. All freshman applicants at this online college in Hawaii should have earned a 3.0 or better GPA in high school. All transfer applicants must have earned at least 24 credits and have a minimum GPA of 2.0. Unlike other online colleges, UH Hilo also requires incoming online students to complete an Online Learning Readiness Check to earn admission. UH Hilo also strives to be one of the most affordable online colleges in Hawaii, offering a wide variety of financial aid options, including federal, state, and UH-specific scholarships. Hawaii may be small in size, however this system of islands is among the most densely populated areas in the U.S. The large population of students enrolled in the state's brick-and-mortar institutions have likely experienced the effects of a dramatic rise in education costs in recent years. Tuition and fees at Hawaii colleges and universities have increased by 97.6% over the last five years, while funds allocated for postsecondary education in the state have increased by only 1.7% to accommodate these growing costs. These figures combined with the state's high cost of living indicate this is a great time to pursue online education in Hawaii. The Hawaii Department of Education is dedicated to providing online college prep courses and distance learning options to both college-bound students and adult learners, respectively. Hawaii Virtual Learning Network is an online consortium designed to make distance learning courses accessible to all K-12 students in the state, through a systematized format developed by the Hawaii Online Task Force. As the state's largest university system, the University of Hawaii also features a comprehensive subnetwork of degrees, certificates and training programs available entirely online. 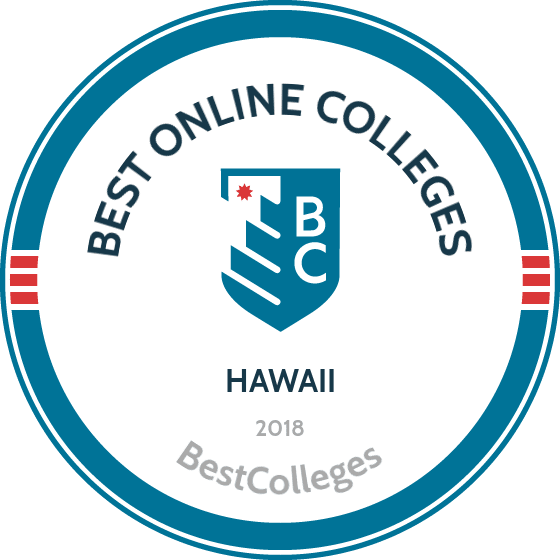 Browse our list of the best online colleges in Hawaii for more insight into distance learning programs in this state. As of fall 2012 enrollment, NCES reports indicate that 11% (8,736) of students enrolled in Title IV institutions in Hawaii were in exclusively online programs. Comprising numerous campuses of the University of Hawaii and Hawaii Community College, Hawaii's largest college systems feature a robust department solely dedicated to distance learning courses. Additionally, schools such as Chaminade University and Argosy University offer programs specific to the needs of distance learners, and Hawaii Pacific offers online courses tailored to military students through a Navy college partnership. To explore future distance learning opportunities in Hawaii and beyond, the Association for the Advancement of Computing in Education will host the 2015 world conference on e-learning in Kona, HI. Employment growth in this profession is moderate in Hawaii. According to the Hawaii Workforce Infonet, long term projections show an increase of 9% in the total number of jobs between 2014 and 2024. Wages increased by 6% from 2011-2016. In Hawaii, what were the top careers in 2016 for people who had a degree in business administration and management? Data source: Hawaii Workforce Infonet, Bureau of Labor Statistics. Data may not be available for every year. Employment growth in this profession is strong in Hawaii. According to the Hawaii Workforce Infonet, long term projections show an increase of 16% in the total number of jobs between 2014 and 2024. Wages increased by 4% from 2011-2016. In Hawaii, what were the top careers in 2016 for people who had a degree in registered nursing? Employment growth in this profession is strong in Hawaii. According to the Hawaii Workforce Infonet, long term projections show an increase of 181% in the total number of jobs between 2014 and 2024. Wages increased by 1% from 2011-2016. In Hawaii, what were the top careers in 2016 for people who had a degree in criminal justice/law enforcement administration? In Hawaii, what were the top careers in 2016 for people who had a degree in psychology? Employment growth in this profession is strong in Hawaii. According to the Hawaii Workforce Infonet, long term projections show an increase of 23% in the total number of jobs between 2014 and 2024. Wages increased by 4% from 2011-2016. In 2016, what were the top careers in Hawaii for people who had a degree in computer programming? Currently, no schools in Hawaii offer an online bachelor's degree program in computer programming.